Actinogen Medical is an ASX-listed Australian biotech developing lead asset Xanamem, a specific 11beta-HSD1 inhibitor designed to treat cognitive impairment that occurs in chronic neurological and metabolic diseases. The primary indication is mild AD, and results from the ongoing Phase II XanADu trial are expected Q219. 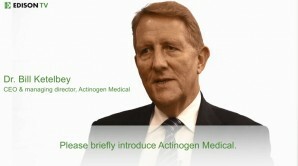 Actinogen Medical is an ASX-listed Australian biotech developing its lead asset Xanamem to treat cognitive impairment that occurs in chronic neurological and metabolic diseases. Xanamem® is a selective 11beta-HSD1 inhibitor that is able to cross the blood-brain barrier and target excess brain cortisol, which has been associated with cognitive impairment in Alzheimer’s disease (AD). The ongoing Phase II XanADu trial is fully enrolled with mild AD patients, who receive Xanamem in conjunction with standard of care. The results are due by end-Q219 and will shape further development of Xanamem. Actinogen had cash of A$15.5m at the end of fiscal H119 (end of calendar 2018) which is sufficient to finish the XanADu study, additional studies and prepare for Phase III trials. The unmet need in AD is vast and the size of the market has attracted interest from almost every player in CNS drug R&D over the past 30 years with very limited success so far. With so many late-stage failures, we believe, that ‘non-mainstream’ technologies, like Xanamem, may attract renewed interest from potential partners.